October 31, 2013 Shawn Wildermuth No Comments. I finished up my post-con for AngleBrackets today and am ready to head home. I had a great time and just spectacular attendees who had great questions! 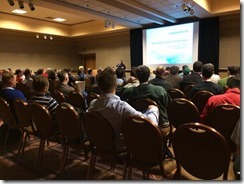 If you have a chance to go to AngleBrackets (or it’s sister conference, DevIntersection) make the trip. They’re coming to Orlando this fall! My Practical PhoneGap Course is now Live! April 24, 2013 Shawn Wildermuth No Comments.